Phenom Nutrition LLC, the first natural product company of its kind, officially announces its launch. Created by father and son natural product sports veterans, Ken and Troy Muller, Phenom Nutrition is expected to be an industry “game changer”. We spent nearly two years working with pediatricians and nutritionists to come up with formulas for our company that give the younger competitors a nutritional advantage to build healthy lean muscle, recover and excel…and they taste great! Phenom Nutrition LLC, the first natural product company of its kind, officially announces its launch. Created by father and son natural sports product veterans, Ken and Troy Muller, Phenom Nutrition is expected to be an industry “game changer”. What makes the company different from other nutritional shake companies, is the proprietary formulation and the all-natural ingredients. The protein Phenom Nutrition uses is a blend of non-rBGH and non-rBST whey isolate and casein protein. For additional information about Phenom Nutrition, please visit the company website at http://www.phenomnutrition.net. 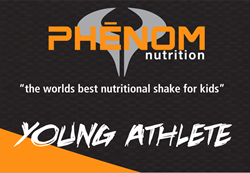 Founded by father and son sports supplement veterans, Ken and Troy Muller, Phenom Nutrition creates nutritional shakes and other products formulated specifically for active children. The shakes contain a proprietary formula of all-natural ingredients and are proudly made in the U.S.A. The company is headquartered in Wellington, Florida, with an online store that ships products worldwide. A percentage of all company profits are donated to St. Jude Children’s Research Hospital and other charities that help children in need. For additional information visit http://www.phenomnutrition.net.